Kaptain Klaw was to be a villain in Eagle Force's cancelled wave. For my other unproduced RIOT character customs, I've updated the designs, but stayed true to the original concept. With Kaptain Klaw, I had to throw out the Paul Kirchner design almost entirely. It looked like a Halloween costume. It was too Disney's Captain Hook. I retooled Kaptain Klaw as a modern day Somali-type pirate working for RIOT. Image checks show that today's fashion-forward pirates can dress anywhere from paramilitary to absurdly casual. Kaptain Klaw has a "might stop to watch a soccer game after pirating" look now. Gone are the centuries old uniform and pirate hat. Given the name, I kept the claw hand, using the simplistic Battle Droid hand instead of a hook. A peg leg and a robot hand would be too much, so the peg leg had to go. 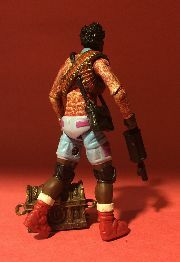 The Paul Kirchner design did feature web gear, which I replaced with a satchel and ammo belt. The Breaker torso provided a slender build in an athletic shirt and the Alpine legs provided cargo shorts. Pretty casual. Even looking at the black & white design, it's obvious that Mego would have let go with the colors on Kaptain Klaw. Burgundy? Yellow? Purple? Probably. Despite having changed Kaptain Klaw's core design, I wanted the character to be colorful and crazy, like Colin Baker's 6th Doctor (the best Doctor Who, for those of you who aren't aware). 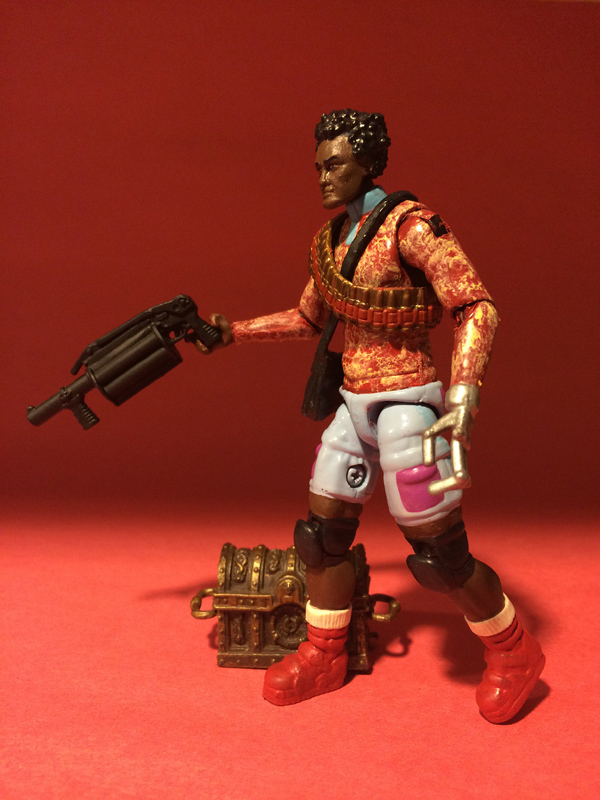 The easiest way to do this was to put Kaptain Klaw in a crazy shirt, with a swirled dyed look (the finished pattern looks more like digital camouflage, though). Sky blue shorts with violet pockets... and the eyes are purple, too. The hair is sculpted. The claw is glued to the arm. I picked "Kaptain Klaw" for the character's name, but there were three possible choices Mego had ready to use. The others two were "Barracuda" and "The Shark". 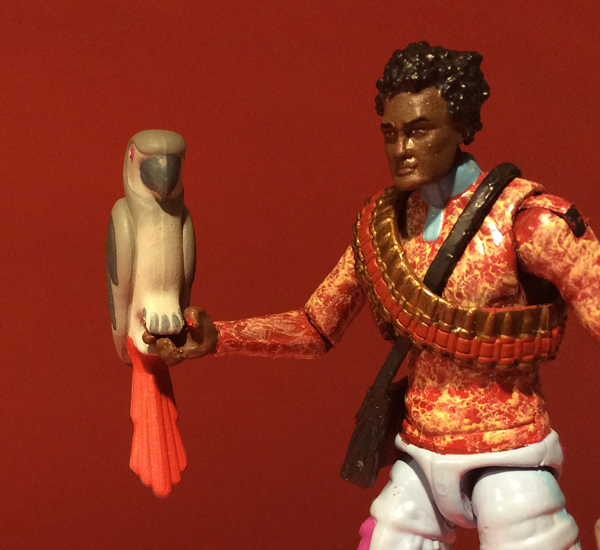 After avoiding the cliched movie pirate look, I moved back a step and added a parrot. It was a good way to use up one of the proposed names, so the parrot was named "Barracuda". Then I realized if I painted another parrot I could use up BOTH names. So the other parrot is "The Shark". Not wanting these parrots to be repaints of Shipwreck's parrot, Polly, I chose Playmobil parrots. The Hasbro Polly figures have been more realistically sculpted compared to the Playmobil parrots. But the Playmobil parrots, which are also oversized for 1:18 figures, dress up alright with a paint job. Since Polly is green, Barracuda is yellow and The Shark is grey. 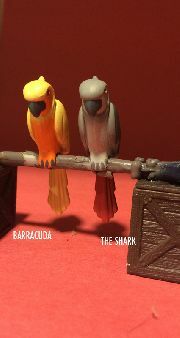 Barracuda's color scheme is based on Sun Conure parrots (sans the green wing tips) and The Shark's is based on African Grey parrots. 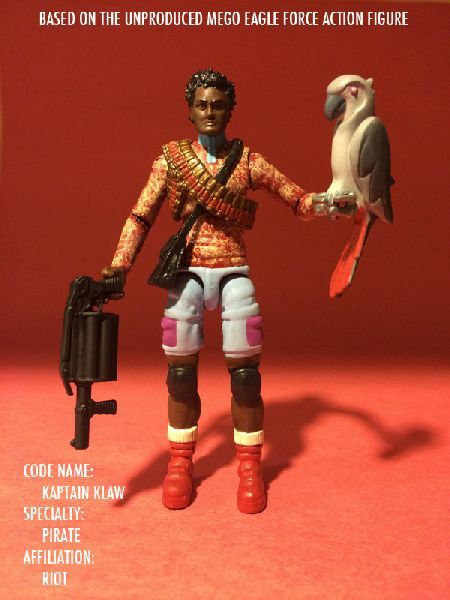 Both parrots have violet eyes to link to Kaptain Klaw's color set. Some of the details are painted in because they're not sculpted onto the figures.